Private villa situated on the hills between the two ancient cities of Cortona and Arezzo. The house is surrounded by a 10,000 m² garden covered with olive trees argentanti, in a quiet location bordering a nature reserve yet 3 minutes from essential services and good access. Covered patio for outdoor dining. Guests have a private infinity pool 15 X 5 (open June 1 - September 14) that will make the stay even more enjoyable. Near the outdoor bathroom with shower. The person in charge of the reception will be available for any information and also for advice about finding typical Tuscan products produced nearby. Also possibilities for guests to gather fresh vegetables from. At 15 km you will find the town of Arezzo with its old town and the medieval town of Cortona. From the local station (5 km) you can take trains to the center of Florence & Rome, as well as the famous tourist resorts of Assisi & Orvieto. Games for children, table tennis, basketball, badmington, bocce. The house consists of a first floor with three double bedrooms, one twin bedroom (joinable), a bathroom with shower and a bathroom with bath, living room / kitchen equipped with all accessories. A stunning villa with an incredible swimming pool and a very attentive host highly recommended! 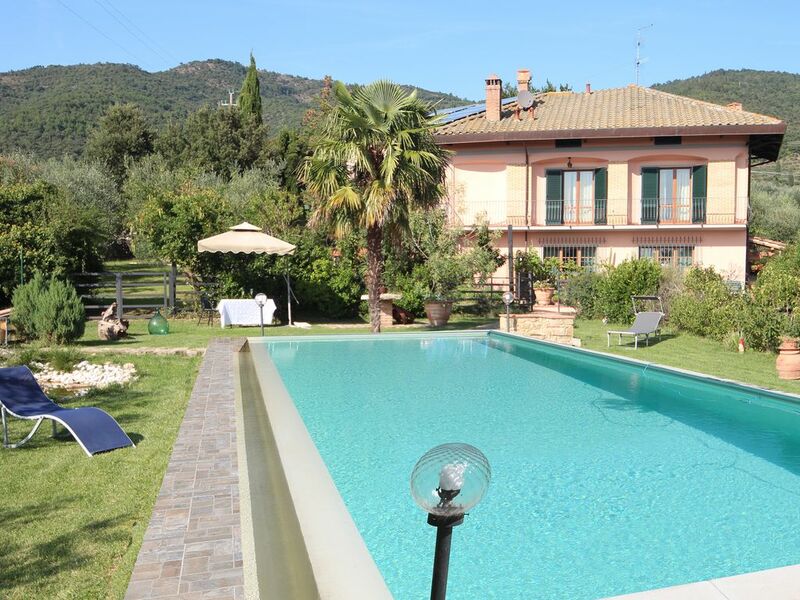 This wonderful 4 bedroom, 2 bathroom villa, with incredible swimming pool and a very attentive host is perfectly situated in the heart of Tuscany and has views forever. It provided very spacious and comfortable accommodation for our extended family group of 7 and was very well appointed with everything we could possibly need including wonderful outdoor pizza oven and BBQ. Piero is an incredibly attentive host who is always available and encouraged us to help ourselves to tomatoes from the greenhouse and figs from the garden. He generously shared homemade fig jam, lemoncello, salami and another alcoholic drink with us and nothing was too much trouble for him. A train from nearby Arezzo took us to Florence within an hour and Siena was an easy one hour drive away. We loved exploring beautiful Cortona and Castiglion Fiorentino and would highly recommend a trip to the hidden gem - hot springs in Bagni San Filippo. There is also a great selection of grocery stores less than a ten minute drive away. On site olive groves add to the charm along with 2 goats, a pig, a couple of roosters, chickens, ducks and the adorable dog Laika who members of our party loved taking for walks and spoiling. Altogether an amazing place to spend an idyllic Italian week in a Tuscan Villa and one we would highly recommend. Wish we could have stayed for longer! Thank you Piero for your hospitality. We had a fantastic holiday, staying in this spacious and well equipped villa. There was plenty of room for two families of four and the location was perfect to explore beautiful Tuscany. The pool is amazing - you would find a similar size in an apartment complex. But the highlight for us was wonderful Piero, the owner. He could not do enough for us and takes such pride in ensuring his guest have an enjoyable and memorable stay. We hope to return one day in the not too distant future. Wir waren sechs Personen und haben uns sehr wohl gefühlt, der Hausbesitzer war sehr zuvorkommend und stets bemüht. Wir haben jeden Tag frische Tomaten aus dem eigenen Garten bekommen! Das Haus ist in einem sehr sauberen Zustand und die sanitären Einrichtungen sind rund um erneuert. Man kann auch jederzeit kochen da die Küche gut ausgestattet ist. Insgesamt war der Aufenthalt sehr zufrieden stellend und wir haben ihn sehr genossen! Wir sind schweren Herzens abgereist, Da wir uns wirklich sehr wohl gefühlt haben. Der Außenbereich ist sehr sauber und gepflegt. Der Pool ist groß und sauber und in Top Zustand. Von Arezzo ist man mit dem Auto 15 Minuten entfernt in der Nähe kann man in zwei Lebensmittelgeschäften Lebensmittel kaufen. Wir werden auf jeden Fall wiederkommen und können dieses Haus nur weiter empfehlen.